You are cordially invited to Audio Soup festival near Garvald in the Borders, south of Edinburgh, for two days and nights of music and merriment. We have four different stages on which will be a plethora of bands, DJs and performers. Tickets are a bargain £20 for the day or £40 for the weekend. 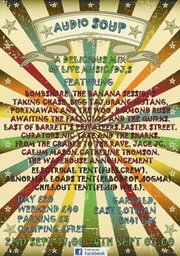 I am very excited to be rounding off the Friday night in the Abnormal Loads tent from 1am to 3am plus many of you will know Glasgow's favourite bon vivant DJ Dandy (Disco X) who will be playing on the Saturday afternoon. This will be a ball!! !